Perspective. That was my biggest takeaway from reading Sapiens: A Brief History of Humankind by Yuval Noah Harari. 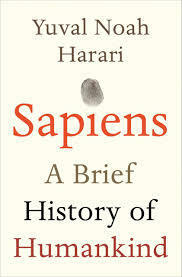 He does a masterful job in articulating the history of our species and the forces that guided our culture. His narrative encourages us to reflect on our own role in the universe and try to understand what’s meaningful in life and what isn’t. I was amazed to learn that there were multiple different human species, and that ours “won out” due to the creation of myths that effectively organized large numbers of people. Surprisingly, similar myths still persist today. Companies, money, religion, they’re all inter-subjective fictions that govern our daily lives. However, just because these fictions don’t exists a priori in nature doesn’t mean they aren’t important. It’s just helpful to remember that fictions like money are built on trust, and in rare cases (like the 2007 financial crisis) that faith can be strained or even broken altogether. I was also surprised to learn that the advent of farming is actually “History’s Biggest Fraud”. You’d think that cultivating farmland would be a boon to our ancestors, yet farming was much harder work than foraging. Relying on one staple crop provided a less balanced diet than the varied intake of foraging. Most farmers hoped to reach a state of affluence by achieving food surpluses, yet this just lead to a population growth that created more mouths to feed. Never forget second-order effects! One other oddity I’ve often wondered about: how did a tiny island in Europe conquer so many global territories? England had, above all others, a great desire to learn and cure its ignorance using the scientific method. This quest to improve knowledge, in conjunction with a deep national pride and desire for conquest, led the country to fund risky expeditions to all corners of the globe, expanding their empire. I think I most appreciated the power that the individual has in our current age. We’ve advanced technologically by leaps and bounds, and as most dystopian books or movies will tell you, with that great power comes a great responsibility. Climate change is real folks. We have not been very hospitable guests of this planet, exterminating entire species of animal wholesale and polluting our environment. Yet through our ingenuity, we have the ability to develop renewable sources of energy, preserve endangered species, and even one day colonize other planets like Mars (really hoping to live long enough to see that one). Yeah Science! Sapiens is a great read for people from all walks of life. Harari touches on a few dozen fields of study like history, biology, economics, philosophy, political science, computer science, and psychology to name just a few. His work is a great reminder of where we come from and where we might be going. He notes that “History has a wide horizon of possibilities, the vast majority of which don’t get realized.” He reminds us of our own possibility as a species and that today, more than ever, we have the power to shape it.